The MuckBoot company has specialized in 100% waterproof, performance boots since 1999. Beginning with one boot design, over the past two decades they have expanded their offerings to include over sixty styles of rubber and leather footwear for cold and wet conditions in agricultural, hunting, active outdoors, equestrian, and urban settings. MuckBoots leads the industry in boots for extreme outdoor conditions. They build the Arctic Pro Hunting Boot from rugged, waterproof materials. The multi-layered synthetic and fabric construction helps your feet stay warm and dry, even in mud, rain, snow, and ice. The lower portion of the boot consists of a synthetic rubbery material that flexes and bends to conform to your foot while holding its shape, while the upper half of the boot is made of a breathable but waterproof fabric to save weight and add flexibility. MuckBoots offers the Arctic Pro in three colors: brown, bark, and camo. Brown and bark are understated and muted colors, as you would expect. The camo is Mossy Oak’s popular Break-Up pattern, which features leaves and twigs against a medium-soft background of bark. According to users, the Arctic Pro doesn’t run large or small. The boots are easy to get off and on thanks to the neoprene upper opening and stretch-fit topline. In outdoor and hunting applications, easy removal is a safety benefit: being able to pull out of the boot quickly can save you from a broken ankle or other mishaps. The boots stay on fine when needed, too. The Arctic Pro Hunting Boot has a comfortable EVA foam cushioned midsole, with a 2mm thermal foam underlay. Compared to equivalent leather boots, these boots are much more comfortable for walking long distances. Double reinforcements at the instep, heel, and Achilles help the boot retain its shape for life. The thermal foam inside and the heat-conserving exterior design make these the warmest boots we’ve ever reviewed, especially when you pair them with good warm socks. With a lower range of -60 degrees Fahrenheit, you can use these boots to keep warm anywhere in the world. If it’s more than 35-40 degrees Fahrenheit out, we recommend you use a thinner sock! The Arctic Pros are not only incredibly warm, they’re also 100% waterproof. You can walk in standing water, and as long as that water isn’t higher than 18 inches, your feet will stay warm and dry. They’re also breathable, unlike 100% rubber boots. If you do get the boots wet, they quickly dry once you take them off, thanks to the Arctic Pro Hunting Boot’s quick-drying materials. Some users have reported putting them in the dryer for faster drying with no issues. The Arctic Pros come with a grippy sole, the “Bob-Tracker molded outsole.” It’s thick enough to provide some padding against rocks and other obstacles underfoot, without weighing down the boot excessively. The sole performs well on snow and mud, and reasonably well on ice. The performance on ice doesn’t compare to dedicated ice boots, but you could always add ice spikes if you plan on walking around on the ice. These boots aren’t steel-toe, but they do offer some toe protection in the form of a wrap-up bumper. The bumper is a thicker section of the sole that curves up and in front of the boot’s toe. It’s not going to keep your toes from getting crushed under heavy weight, but it can help prevent bruised or sprained toes if you stumble or drop something on your foot. 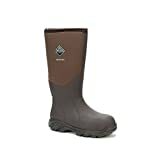 MuckBoots only offers the Arctic Pro Hunting Boot in a Medium or “D” width. According to the company, these boots “can stretch up to an EEEE width,” but it would be nice if they offered more widths. The Arctic Pros only come in whole sizes. Most users don’t find this to be an issue, but it makes buying a pair of these boots as a gift a little bit challenging. We understand why MuckBoots might choose to offer whole sizes only, but from the customer’s viewpoint, it can result in needing to exchange boots unnecessarily. Some hunters have reported that thorns can tear the 8mm CR flex-foam and four-way nylon upper. The upper is lightweight, breathable, and waterproof, but it could be resistant to rips and tears. Scott R. uses his Arctic Pros for ice fishing with regular socks. His feet don’t even get a little bit cold. The boots started too narrow but expanded to fit his wide feet over time. Ian Y. says the MuckBoots Arctic Pro are great boots for early season walleye in Michigan. When the season opens it’s snowing, and the boat quickly takes on the temperature of the surrounding water, but he says these boots are perfect. Mona actually took her Arctic Pros on a job to the Arctic. She says they were excellent, and she wore them during the entire assignment. Her feet stayed dry and well-insulated. MuckBoots are a true innovator of hunting and extreme outdoor boots. The Arctic Pro Hunting Boot is waterproof, warm, lightweight, breathable, and offers a reasonable amount of protection for your feet. It also keeps your lower leg warm, thanks to the tall upper. There’s no other boot on the market that meets these criteria and also keeps your feet warm when it’s sixty degrees below. This boot is an excellent value and incredible quality, and won’t let you down whether you’re stalking through the woods on a cold morning or sitting in a chilly hunting blind.